The Hamilton Accies boss responded to reports that his dad had leave their cup tie early. 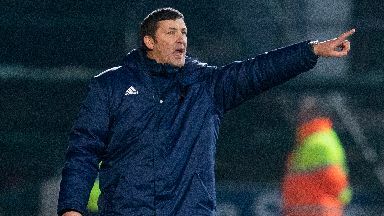 Hamilton boss Martin Canning has said that he'll take criticism after his side were knocked out of the Scottish Cup but he said that targeting his family for abuse was unacceptable. Goals from Jason Kerr and Tony Watt saw St Johnstone progress to the last 16 but Canning had to field questions about fan behaviour as well as his side's performance in defeat. Responding to reports that his father had to leave the match before half-time after getting flak from supporters, Canning said: "That's news to me, I haven't spoken to him. "I understand frustration, Fans want to win games. But if my dad has been abused I don't accept that, if it gets personal. "I can take it on the sidelines. It is part of my job but that is not acceptable in any way, shape or form. "But there's no chance of me walking away. I'm committed to this club and doing my job. "I won't be placed in a position where I make long-term decisions based on that." Stewards had to separate some of the Accies' 150-strong support after a pie was thrown at goalscorer Watt. Canning said: "That's not the image the club wants and I am guessing it is a small section. I 'm not going to tar all Accies fans with the same brush because that's not fair. "But if security guards are having to separate them that's not acceptable. We want our fans to get behind the club and the team. "This is a small club. We have competed for five years in the Premiership and it is the most successful period in the club's history since the war. We've never been in the league for that length of time." Victorious St Johnstone boss Tommy Wright took pleasure in seeing his side return from the winter break with an instant impact. "It was the perfect start to score within the first minute," he said. "It settled everyone down. We got a bit loose in the second half but I was pleased enough." He singled out Watt for particular praise. "He was in the right place and follows it up when the keeper couldn't hold onto it," Wright said. "His work-rate was evident for everyone to see and you can see how his match sharpness is coming back. Tony can be pleased with his performance."